HOTT (Helping Others Through Theatre) PRODUCTIONS was founded almost two decades ago by Schaumburg residents Christine Seminaro and Donica Seminaro Luzwick, her sister. The non-profit’s dual mission is ambitious: (1) Provide quality musical theater experiences and (2) donate all proceeds to charity. By virtually any measure it’s been a smashing success and the founders show no sign of slowing down. 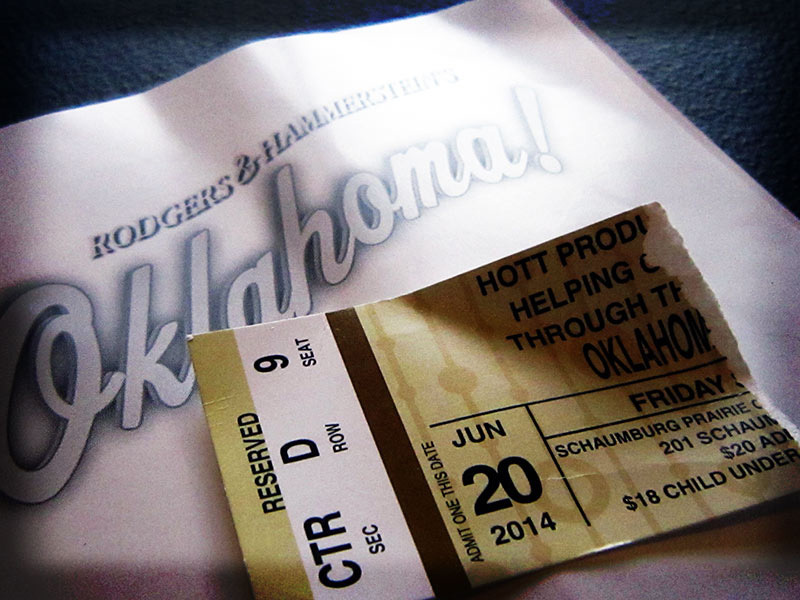 With the help of Donica’s husband, David Luzwick (who joined in 1998), and hundreds of others, HOTT Productions has entertained musical theatregoers of all ages with more than 30 classics—everything from “Grease” and “Guys and Dolls” to “Hair” and “Hello Dolly.” Its current production is “Oklahoma!” by Rodgers & Hammerstein. All proceeds raised by this all-volunteer group have been donated to worthy causes. Recipients include local families in need plus organizations dedicated to autism programming, helping those with multiple sclerosis, cancer prevention and children’s literacy. Tally of their donations so far? In a word, “BOFFO.” Nearly $125,000! Tickets for tonight’s closing performance are still available. (I went last night and left the Prairie Center for the Arts humming and smiling all the way home.) Show starts at 8 PM. To make a reservation, call 847.895-2828. Editor’s note: If you believe in what Christine, Donica and David are doing, perhaps you’ll consider donating your time and talents to help with their next production, “Joseph and the Amazing Technicolor Dreamcoat.” If your calendar’s already full, please consider becoming an Angel to the Arts with a financial donation of $25 or more. You can reach HOTT Productions at 847.650.4688. An aspiring [AND]vertising copywriter on Michigan Avenue, Ms. Morris loves Al. Ringling, the first and best Ringling Brother. This entry was posted in free andvertising and tagged andvertising, Christine Seminaro, David Luzwick, Donica Seminaro Luzwick, HOTT Productions. Bookmark the permalink.